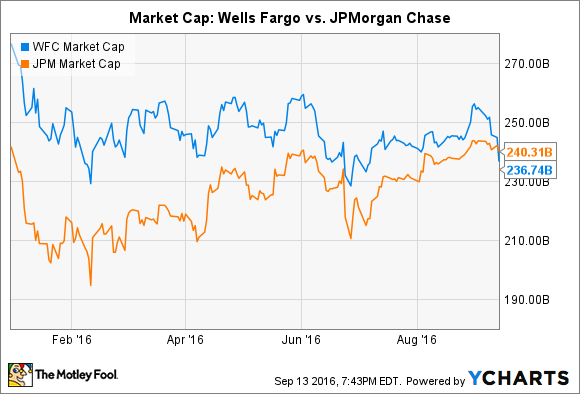 The recent drop in Wells Fargo's share price means that it no longer has a larger market capitalization than JPMorgan Chase. For the past four years, Wells Fargo (NYSE:WFC) was the most valuable bank in the United States. But that's no longer the case. Thanks to fallout from an unfolding scandal, Wells Fargo's market capitalization has now been eclipsed by JPMorgan Chase (NYSE:JPM). Wells Fargo's current market cap is $237 billion. That's down from just under $300 billion in August of last year. JPMorgan Chase, meanwhile, has seen its own market cap temporarily settle at just over $240 billion. The fact that Wells Fargo was ever able to exceed JPMorgan Chase in terms of market value, much less to stay in the lead for nearly half a decade, is impressive when you consider that JPMorgan Chase is a much larger bank. At the end of the second quarter, JPMorgan Chase had $2.5 trillion worth of assets on its balance sheet. Wells Fargo stood at only $1.9 trillion, a third smaller than JPMorgan Chase. Given their respective sizes, you'd be excused for wondering how it was possible for Wells Fargo to be worth more than JPMorgan Chase. The answer is that its shares traded for a higher multiple to book value. 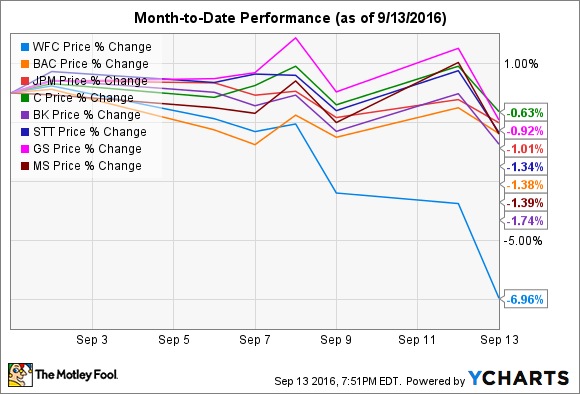 In August 2015, Wells Fargo's share price topped out at 1.8 times its book value per share. That compares to JPMorgan Chase's valuation which briefly topped out at 1.2 times book value around the same time. Thus, while JPMorgan Chase was approximately a third larger than Wells Fargo when it came to the size of their balance sheets, Wells Fargo's valuation was roughly a third bigger than JPMorgan Chase's. The latter had tipped the scales in Wells Fargo's favor when it comes to market cap. Wells Fargo's decline can be traced to the recent revelation that thousands of its employees fraudulently opened as many as 2 million deposit and credit card accounts for customers without customers' knowledge or content. Chairman and CEO John Stumpf intimated in an interview on CNBC that this figure represents accounts that "couldn't be ruled out" as being fraudulently opened. Regardless of the number, this was allegedly done in order for the bank's employees to keep their jobs in the face of unreasonably high sales quotas. The takeaway here is one that Wells Fargo's largest shareholder knows better than anyone. As Warren Buffett has opined in the past: "It takes 20 years to build a reputation and five minutes to ruin it."